Ultraman’s full range of powers has not been revealed but the following are his known abilities. Heat Vision: Ultraman has a from of heat vision. Flight: Ultraman is able to fly. Technology: Ultraman has access to a huge amount of alien technology which includes: Teleporters, Phantom Zone Projectors and technology to mutate creatures like Ultra Titanus. Flying Fortress: Ultraman has a flying vehicle in which all his alien technology is stored. Braniac: Ultraman has enslaved a 12th level trans-organic syntellect being called Braniac. The being serves him and carries out his orders. Ultraman was originally a deep space astronaut exploring space when his ship imploded in Hyperspace. An unknown entity pieced his body back together but with only a limited understanding of human physiology the entity accidentally gave Ultraman superhuman powers. 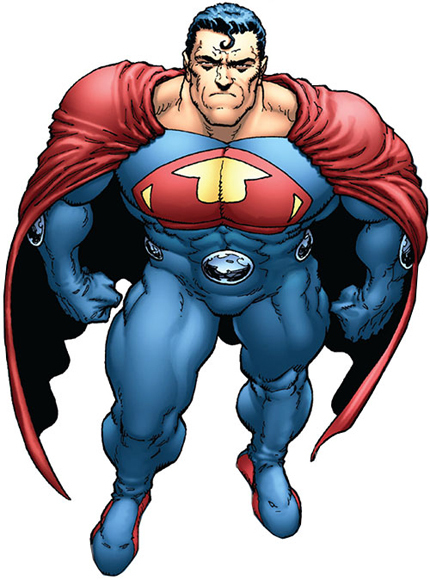 Powered by Anti-Kryptonite and his mind twisted he returned to earth and became leader of the Crime Syndicate of Amerika. The Crime Syndicate is a collection of super villains that rule Anti-matter Earth.